Owen Ogletree's Guide to the best places for beer in Savannah, Georgia. conditioning inside a variety of wooden barrels. Savannah is a beautiful southern belle of a city that was thrown into the spotlight a few years ago by being featured in the book and movie “Midnight in the Garden of Good and Evil.” Tourism has skyrocketed, new businesses are springing up all over town, and the downtown historic district is more beautiful than ever thanks to the restoration of hundreds of venerable homes and businesses. Savannah, the oldest city in Georgia, has a quirky, eccentric charm and will quickly endear itself to almost anyone. Visitors who are new to Savannah will be in awe of the city’s beautiful cobblestone streets and squares, buildings that are centuries old, Spanish moss hanging from the oak trees and personable pubs in which to sample fine beers. Historic downtown Savannah is quite small, and this allows the beer lover easy access by foot to each of the stops on this crawl. The Savannah River runs along the northern border of downtown with River Street (the town’s most touristy pedestrian promenade) following along its banks. Bay Street is a bit of climb one street south from River Street and serves as the main thoroughfare through the historic portion of downtown. Obtain a street map from any tourist brochure and make your way to East Bay Street and Drayton. You’ll be near the conspicuous Hyatt hotel and the golden domed city hall building on Bay, and very close to your first beer in Savannah! This article first appeared in Southern Brew News. Churchill’s is located across the street from the Hyatt Regency (look for the British flag emblem on the street sign). Owner Andy Holmes from Manchester, England rolled into Savannah twelve years ago on holiday, fell in love with the town and stayed to open Churchill’s. The pub’s original location (right around the corner on Drayton Street) suffered a kitchen fire in 2003 and was shut down. Andy immediately made plans to move the establishment to its much larger location on Bay Street that features a gorgeous bar made of dark wood, several small dining rooms, an upstairs terrace and a cellar room with darts, pool and video games. Churchill’s boasts 21 beers on draft, including fine selections like Hobgoblin Ale, Corsendonk Abbey Ale, Monty Python’s Holy Grail Ale, and Franziskaner Hefeweizen. There are also 40 bottled beers such as St. Peter’s Ales, Samuel Smith’s Oatmeal Stout, Black Sheep, Old Peculier, Ommegang and Hennepin. A talented kitchen staff serves up a wide variety of adventurous, hearty fare in big portions. Traditional British dishes like fish and chips, bangers and mash, bubble and squeak, and Yorkshire pudding reside on the menu alongside local, lowcountry favorites such as shrimp and grits and blue crab cakes. European soccer matches light up the pub’s television screens, and live music is offered downstairs on Friday and Saturday nights. Join Moon River's John Pinkerton on a video brewery tour from October 2008. Moon River, Savannah’s only brewpub, can be found next door to Churchill’s. Founded in April of 1999 in the space that was once Oglethorpe Brewing Company, Moon River is housed in a gorgeous, old building that was once one of Savannah’s original hotels in a former life. Many folks say that the spirits of a variety of long dead Savannah natives and visitors haunt the building. The brewpub and adjacent dining areas are warm and cozy, and the award-winning beers are outstanding. Head brewer John Pinkerton (a former brewer with Frederick Brewing of Maryland) usually offers a big variety of house beers such as Swamp Fox IPA, Captain’s Porter, Wild Wacky Wit, Moon Light, Savannah Fest Beer and Claire de Lune Kolsch (a silver medal winner at the 2005 GABF). A seasonal hard cider made with juice from north Georgia apples is also popular. Interesting seasonal beers are offered on a regular basis, and on some Thursdays Moon River also taps a cask-conditioned beer that is served from an authentic English hand-pump. Brewer/owner John Pinkerton and business partner Gene Beeco bought Moon River from the original owners in June of 2004 and have done a marvelous job of making the business a success and creating a family-like solidarity among the employees. John goes the extra mile to insure great quality beers are being poured at Moon River. “The Swamp Fox IPA has such a great hop aroma because of the large amount of hops I add right into the fermentation tanks. This is usually called dry-hopping, but I’ve had nice results with hydrating the hops with water before adding them to the tank,” says Pinkerton. Besides the beer, Moon River also has delicious food items. John Pinkerton loves the smoked pork shoulder. “The pork is very smoky, tender and delicious,” he says. There is also a crab melt – toast, cheese and crab come together in a yummy, gooey casserole. The wraps, burgers, quesadillas, and grilled chicken salad round out the mouth-watering food list. When leaving Moon River, walk left out of the front door and go three blocks. Turn left onto Jefferson, walk through the City Market, turn right onto W. Congress and look for Molly MacPherson's on your left. Savannah’s beautiful and inviting Scottish pub is behind City Market on Congress between Jefferson and Montgomery. It’s amazing that tiny Savannah now has four UK-style pubs (one English, two Irish and one Scottish) all within a few blocks of each other (and the owners all get along). 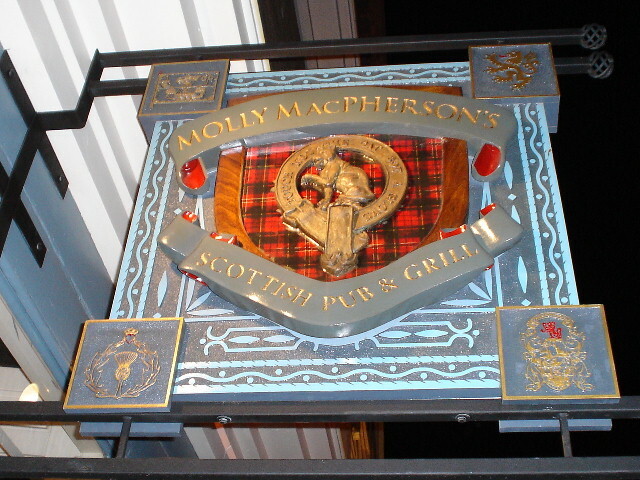 Molly MacPherson’s opened in July of 2005 and features kilt-wearing bartenders, the city’s largest single malt selection, Celtic music and eight drafts (including McEwan’s Ale and Asheville’s Highland Brewing Company Gaelic Ale. There are also 35 interesting bottled beers, with the powerful McEwan’s Scotch Ale being the hearty standout. The pub is named for the great-grandmother of the owners, and the armorial badge of the MacPherson clan is proudly displayed on the street above the front door. Hungry pub crawlers will be impressed with grub the likes of potato scones, meat pies, neeps and tatties, Scotch eggs, Guinness onion rings, roast chicken and salmon, steaks, sandwiches, fish and chips and steak and Guinness pie. Swing left out of Molly’s, cross Montgomery Street and look out on the left for Savannah’s newest Irish pub. Murphy's Law has 20 taps (Moon River, Sweetwater, Anchor, Carolina selections) and a good bottled beer list. The facility was purchased by the current owners in March of 2006 and has been renovated into a very attractive and friendly establishment. There is an upstairs bar with low ceiling, sports TVs and darts. Be sure to try the full pub menu that features meat pies, soups, salads, burgers, sandwiches and fish and chips. The pub opens for lunch everyday at 11 AM, and there is also Celtic Karaoke every Wednesday starting around 10 PM. Take a left out of Murphy’s and look out on the left for Savannah’s largest cellar billiard hall. A range of decent bottled beers can be found on the shelves at B & B, and 8 draft taps offer one or two interesting beers on occasion. The establishment houses several pool tables and two dart lanes. Exit to the right out of B & B and walk down West Congress, take a left on Barnard at the parking deck and after a couple of blocks go right onto West Bay Street. When you spot the Hyatt Regency on your left, walk down the steep, precarious, ancient steps to the left of the hotel down to busy River Street. (A word of caution here -- large cobblestones from England, used as ballast on ships, were used to pave River Street, so be sure to watch your step.) Kevin Barry’s, a true Savannah landmark, will be to your left on River Street. 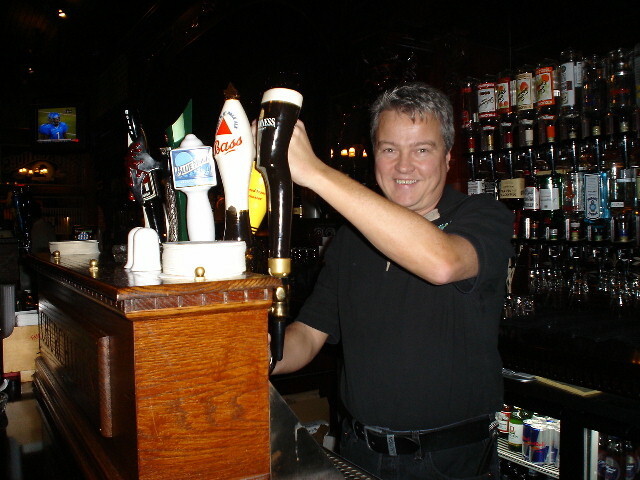 This personable pub is considered by many to be one of the best Irish pubs in the United States. With loads of rustic atmosphere, six draft beers (featuring some of the freshest Guinness in the state), and an earful of the best Irish music on the East Coast, Kevin Barry’s is a must-see stop in Savannah. Kevin Barry’s menu includes pub grub of all kinds including shrimp, wings, cheese sticks, burgers, sandwiches and Irish beef stew. Hours are Monday through Friday 4 pm to 3 am, Saturday 11 am to 3 am, and Sunday 12:30 pm to 2 am. Famous Irish singers do their stuff most every night starting around 8:30 pm. If you can think of any major Irish singer to tour the East Coast, chances are that he or she has performed at Kevin Barry’s. The music hall requires a cover charge of $2. There is a central bar (with no cover charge) and attractive upstairs dining rooms. Kevin Barry’s turned 25 years old in 2005 and is very proud of its history and Irish heritage. 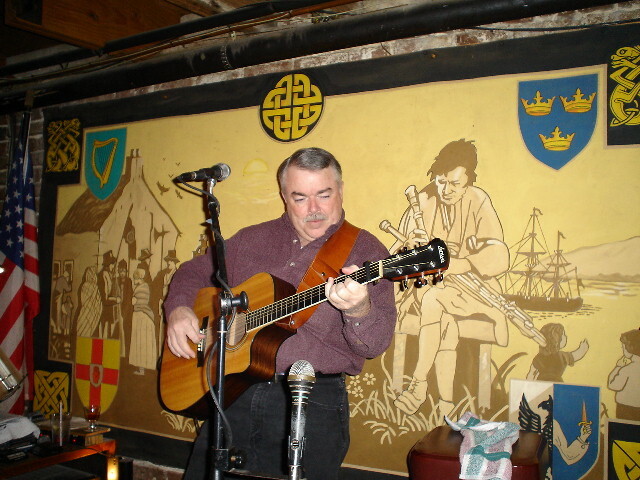 Portraits of notable Irish personalities line the walls, and there is an inspiring Celtic mural behind the music stage. Kevin Barry’s makes a splendid late night end to a pub tour of lovely old Savannah.